Magico's Alon Wolf shows off his new Q1 stand-mounted speaker ($24,950/pair), which marries the beryllium-dome tweeter from the Q3 and Q5 floorstanders with a 7" Nano-Tec–cone woofer. The sealed, hard-anodized aluminum enclosure is braced and damped to minimize resonances. 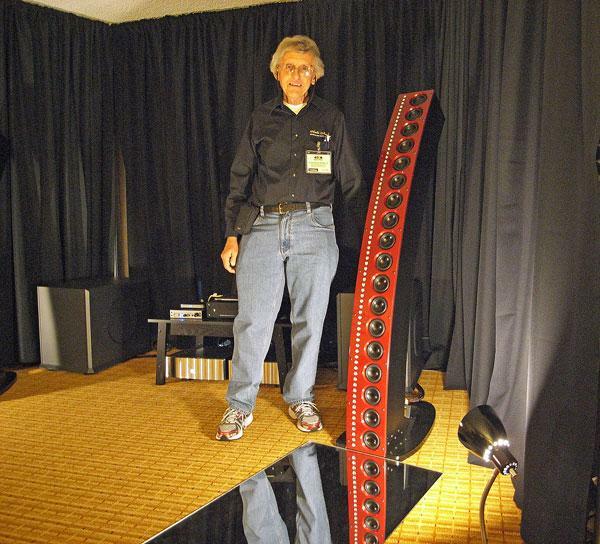 Despite its relatively diminutive sizeit measures 14.2" H by 9" W by 14.2" Dthe Q1 weighs 60 lbs. Driven in Chicago retailer Musical Artisans' room by by BAlabo amplification, a Zanden phono stage, a Clearaudio turntable, and a Bottlehead-modded Nagra open-reel deck to play Tape Project tapes, the Q1s produced a full-range sound that flattered female vocals without sounding mellow or lacking in transparency.
. . . stand-mounted speaker is hardly compact but it is a reference. 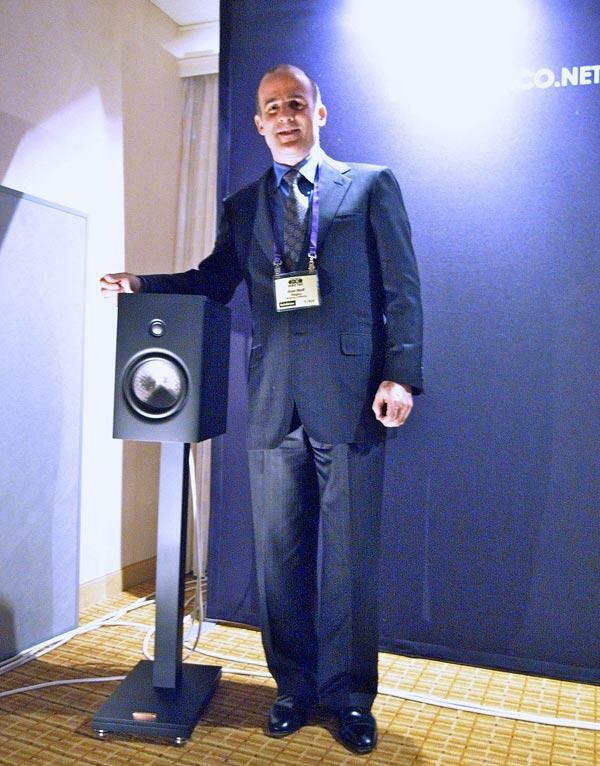 TAD's Andrew Jones was showing off the speaker, which combines a hi-tech coaxial tweeter/midrange array with a port-loaded, high-excursion woofer, with all-TAD electronics, including an asynchronous USB DAC and 600W-into-4 ohms solid-state monoblocks. What did I think of the sound? Well, for that all I will say is that it echoed what I will be writing in my January 2012 review. 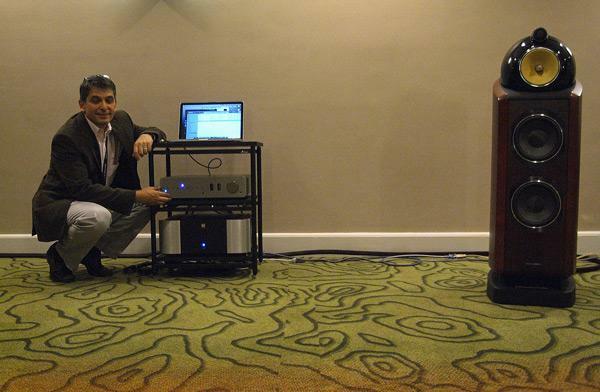 On passive show were TAD's new entry-level E1 floorstanding speaker. Scheduled to cost $27,000/pair, the E1 uses a beryllium-dome tweeter and is a more refined development of the Pioneer S1-EX that so impressed Kal Rubinson a few years ago. It's the perfect name for a preamp, I thought. Grand Pre, if not Grand Prix, has a certain ring to it. The first upmarket product from the company that has made a name for itself with its high-performance iDecco, iNova, and iDac, the Grand Pre will be priced at $3000. It combines the high-resolution ESS 9018 DAC chip with a buffer stage based on 12AX7 tubes, and offers both analog and digital inputs, including a 24/192k-capable USB input. Peachtree's David Solomon, shown in my photo,was demming the Grand Pre with a Simaudio Moon amplifier driving B&W 802 Diamond speakers, using Pure Music on his laptop to send it USB data. Stephen Mejias has already reported on the sound in the room shared by Wilson, Transparent, and Dan D'Agostino. I was equally impressed, agreeing with Millennia Media's John La Grou that one of Peter McGrath's classical recordings, Mahler's Symphony 5 performed by the New World Symphony under Michael Tilson-Thomas and captured with Joe Grado's omnidirectional microphones, was as good as it can get when it comes to two-channel representations of an orchestra. (John manufactures the very-low-noise mike preamps I use for my Stereophile recordings.) 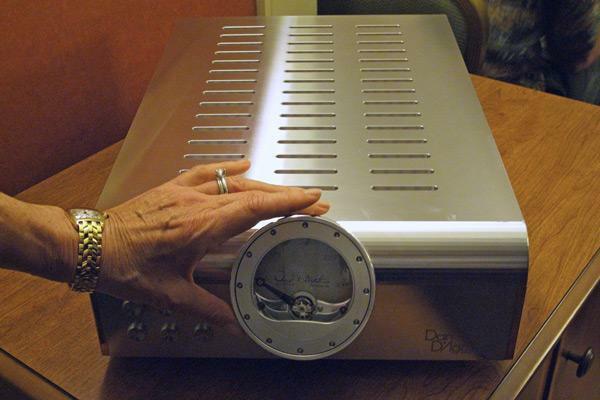 But I really just wanted to show another picture of the forthcoming Dan D'Agostino Momentum line preamplifier, with Dan's wife Petra lending me her hand for scale, as she rotates the volume control ring around the meter. I review Empirical Audio's pricey Off-Ramp 4 asynchronous USBAES/EBU converter with its Monolith 1 battery supply in the forthcoming December issue and was impressed by the quality of its engineering as well as by its sound quality. At RMAF, Empirical's Steve Nugent showed me the Overdrive Ultra D/A converter ($10,000$15,000), housed in a bronze case, which is well-damped. The DAC uses the Off-Ramp 4 circuit as its USB front-end and features just one analog stage following the I/V converter. Unusually, this uses a bipolar emitter follower instead of the common FET buffer. The digital circuitry is powered from the Monolith, feeding 12 Hynes-type regulators, though Steve Nugent feels that the analog stage sounds better when powered from a conventional AC-derived supply. The volume control in the DAC is elegant in that it reduces the reference voltage to the DAC chip, thus maintaining full digital resolution. There are two choices for full-scale output voltage. 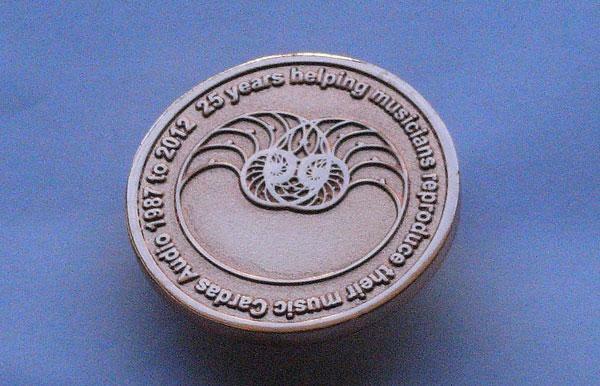 George Cardas had had a celebratory coin minted to celebrate his company's first quarter century: "25 years helping musicians reproduce their music" it states on the front. Amen to that sentiment, George. On the other side of the coin is a tribute to George's friend and mentor, retailer Brooks Berdan, who passed away last summer. When Michael Fremer reviewed the 710 amplifier from Swiss manufacturer Soulution last August, his praise for the sound was surpassed by mine for the measured performance. "The Soulution 710 is definitely one of the best-measuring amplifiers I have encountered, " I wrote, "Color me impressed." 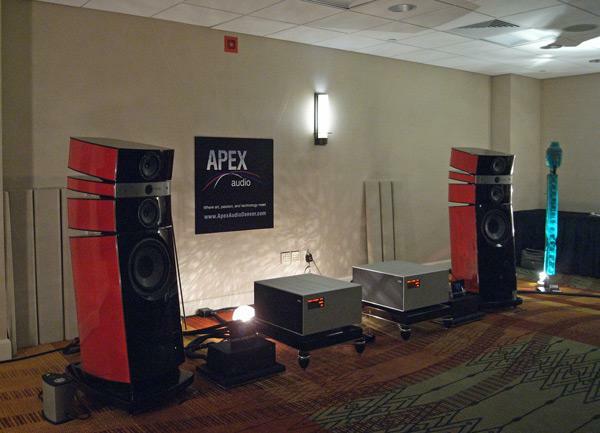 Denver retailer Apex Audio, which is continuing in the tradition of the late John Barnes' Audio Unlimited store, was using the Soulution 700 monoblocks ($130,000/pair), which each offer 430W into ohms, 860W into 4 ohms, were being use to drive Focal's Stella Utopia EM speakers ($90,000/pair), with their electromagnet-powered woofers via Tara Labs cables. 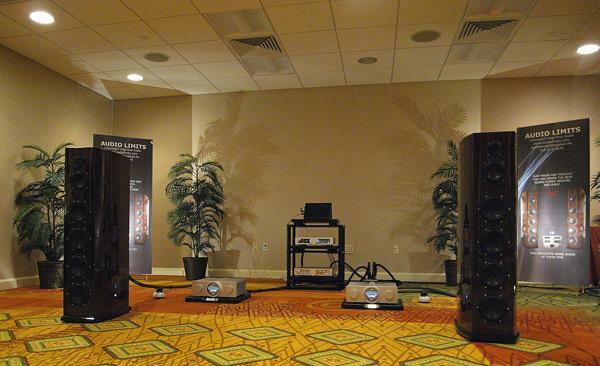 Colorado Springs retailer Audio Limits was filling one of the very large ground-floor rooms at RMAF with sound, courtesy of the massive Venture Grand Ultimate loudspeakers ($90,000/pair) driven by the new AMP M1 solid-state monoblock amplifiers from BMC ($7790 each, $15,580 pair). 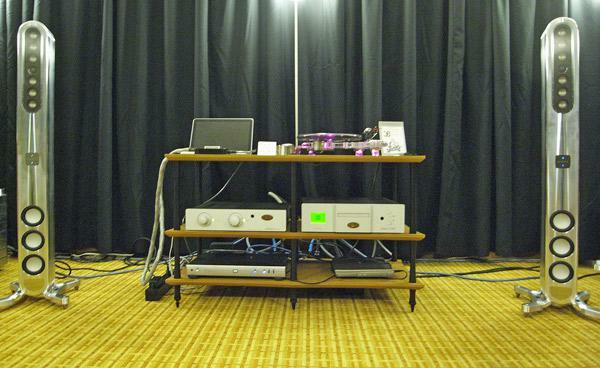 Source was the BMC BDCD1 belt-drive CD transport ($5990), the BMC DAC1 Pre (HR) D/A converter/preamplifier ($6290), with Silversmith The Silver interconnects and speaker cables, Stage III power cables, and Weizhi PRS-6 power distributor. I listened to a track I haven't heard in years in this room, Michel Jonasz's "Les temps passeé," from the CD La fabuleuse histoire de mister swing (1987), and was blown away by the enormous sound, the huge dome of ambience that was defined between and behind the speakers, and the sheer effortlessness with which the music was presented. 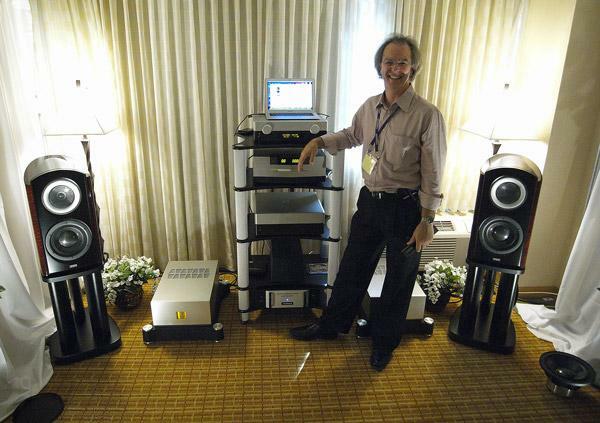 I was intimately familiar with the Sonus Faber Guarneri Evolution speakers $20,000/pair), with their matching stands ($2000/pair), in one of Listen-Up's rooms at RMAF, having measured them two days before I left for Denver. (Art Dudley is reviewing this little jewel of a speaker in the January 2012 issue of Stereophile). 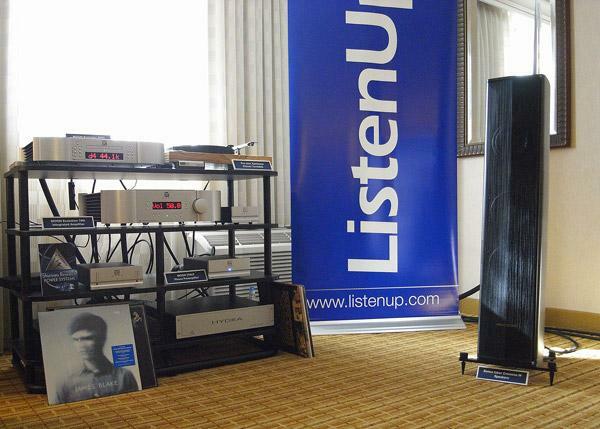 At RMAF, they were being bi-amped with four PrimaLuna DiaLogue 7 tubed monoblocks ($5499/pair) with AudioQuest cable, Preamp was the PrimaLuna DiaLogue 3 ($2699) and while a PrimaLuna ProLogue Classic CD player ($2999) could be seen. this had been broken in shipping and CDs were being played on a Simaudio player. From my listening notes, as I auditioned the classic Chet Atkins-Mark Knopfler gittar-pickin' duet "There'll be Some Changes Made": "maybe a little too rich-balanced but a good sense of pace and impressive low-frequency extension for such a small speaker...unaccompanied female voice had a beautifully liquid quality with space space space!" 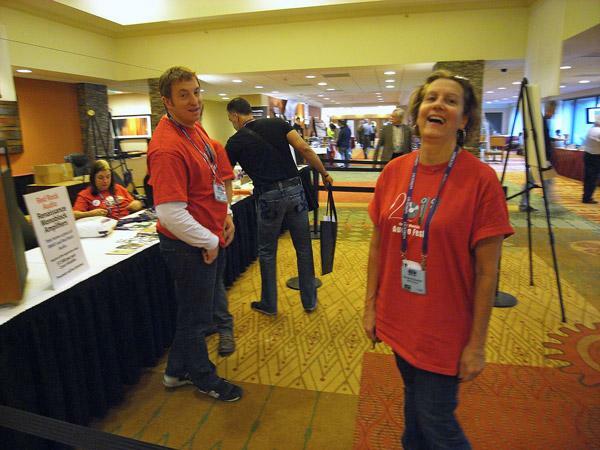 Simaudio's Lionel Goodfield was his usual effective DJ self in the room in Colorado retailer Listen-Up was demming the Canadian company's gear. Digital front-end was the Moon Evolution 650D CD player/DAC ($8000) that Mikey Fremer raves about in the November 2011 issue of Stereophile; analog front-end was the ProJect Xperience Classic turntable feeding a Moon 310LP phono preamp; the Moon Evolution 700i integrated amplifier ($12,000) that Fred Kaplan enthusiastically reviewed for Stereophile last March, was driving Sonus Faber Cremona M floorstanding speakers ($10,000/pair). Cables were all Shunyata Black Mamba and power was sourced from a Shunyata Hydra. 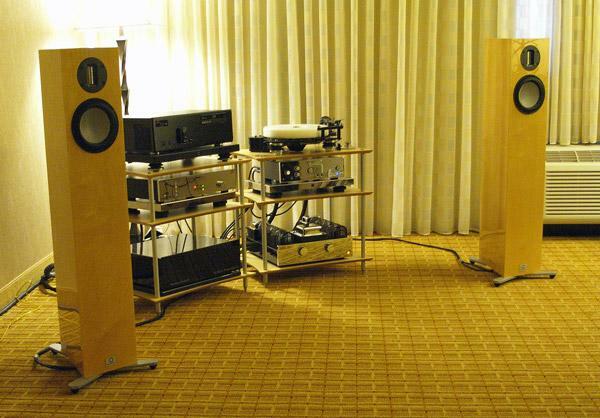 Industry veteran Colleen Cardasand yes, Colleen, I meant the word "veteran" as a complimenthas set up, with vinyl blogger Marc Phillips, a new company Colleen Cardas Imports, to distribute Unison Research amplifiers and Opera loudspeakers in the US. 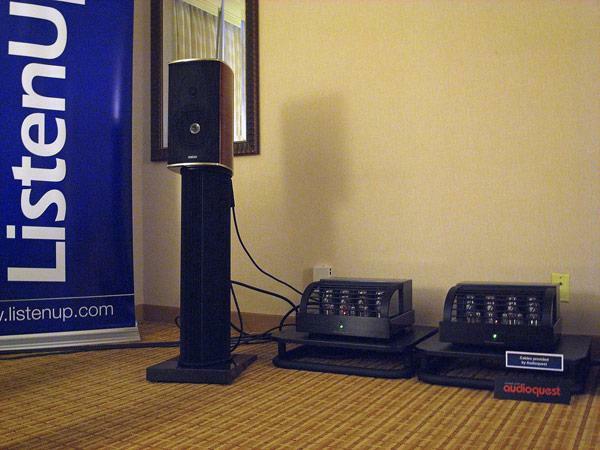 However, the room at RMAF CCI was sharing with Positive Feedback Online was featuring the Sonicweld Pulse Rod active speakers ($125,000/pair including DEQX DSP equalizer). Analog front-end was the Funk Firm Sapphire turntable $5000) fitted with the Funk Firm FXR-II tonearm and a Transfiguration cartridge and feeding a Unison Research Unico Nuovo integrated amplifier ($2795) used as a phono stage. Digital front-end was a laptop running Amarra feeding USB data to the new Sonicweld Divertor ($2888) which fed 24/192 S/PDIF data to the DEQX. Dan Meinwald of E.A.R. USA explained to me that his goal for RMAF was to put together a system where the individual components each cost $6000 or less. The new Marten FormFloor loudspeakers ($6500/pair) just exceed that limit, but are compensated for by the impressive new 192 DACute D/A processor from E.A.R. ($5700 in black but $6500 in chrome). 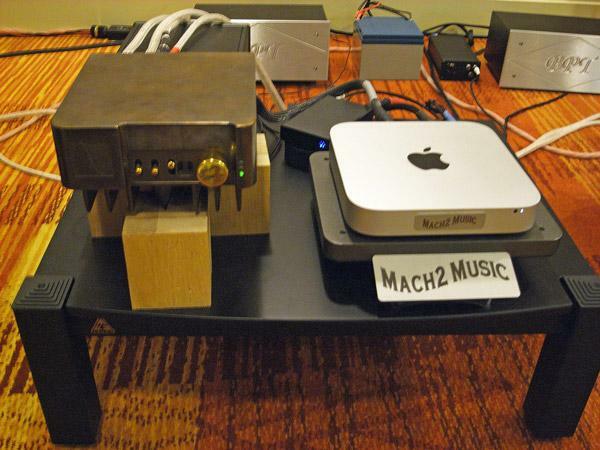 The DAC was being fed audio data by the latest Diamond version of Neal van der Berg's Music Vault ($4449), which incorporates a Blu-ray drive for ripping discs, a 2TB drive for audio data, a solid-state drive for the operating system, and a Lynx aes16 audio output card. The analog front end in the E.A.R. 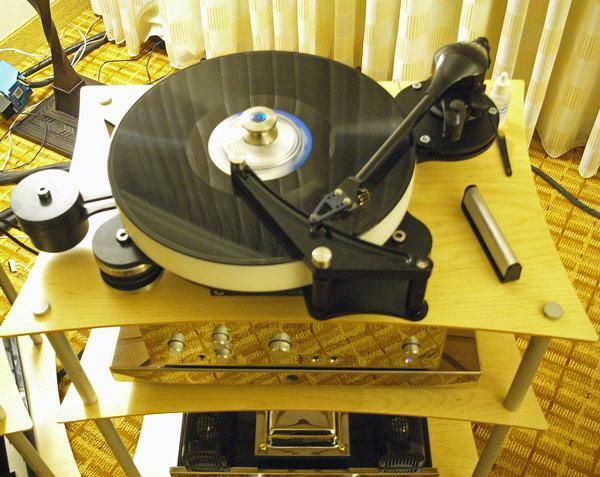 USA room was the Townshend Rock 7 turntable ($3200), with its unique system for applying damping where it is most needed, at the cartridge end of the arm rather than the pivot, fitted with the Helios Omega arm ($2800) and a Dynavector XV1S cartridge. Phono preamp was the E.A.R. 324 that both Art Dudley and Mikey Fremer have enthused over in the pages of Stereophile.